Ricotta is an ingredient that I use only occasionally and never thought about very much. I might pick up a tub when I’m planning on making lasagne (and look a bit askance at the price), but I had never even considered the possibility of making it at home. 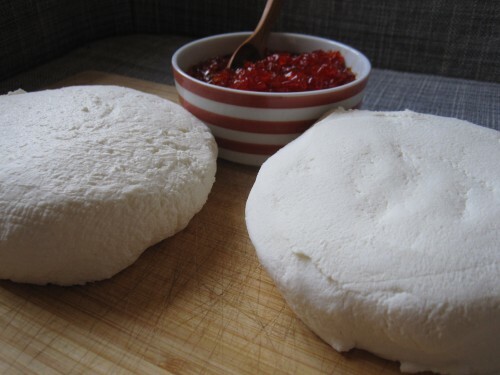 Then I started seeing recipes for homemade ricotta and they looked so easy! I finally decided to give homemade ricotta a try after my mom made some and confirmed that it is, indeed, very simple to make at home. I used the same recipe as my mom because I knew that it had worked for her. It is recipe by Alex Guarnaschelli (love her show “Alex’s Day Off”) and can be found on foodnetwork.com. The only change I made to the recipe was to stir a large pinch of salt into the ricotta just before putting it in the fridge to drain. 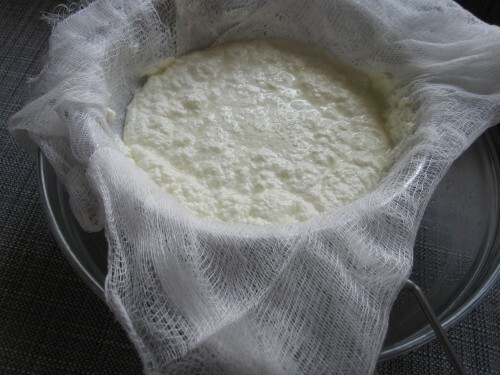 I also sort of shaped the ricotta by twisting the cheesecloth into a ball just before unmolding the finished cheese. 1. In a medium bowl, stir together the diced red peppers and salt. Let sit for 45 minutes to draw out some of the liquid from the peppers. Drain the peppers in a fine sieve, pressing on them with a spatula to extract as much liquid as possible. 2. Put the peppers in a medium saucepan and add the vinegar and sugar; stir to combine. Simmer over low heat, uncovered, for about 1 hour or until liquid begins to thicken and becomes syrupy. Cool and serve over cream cheese, mascarpone or ricotta with crackers. 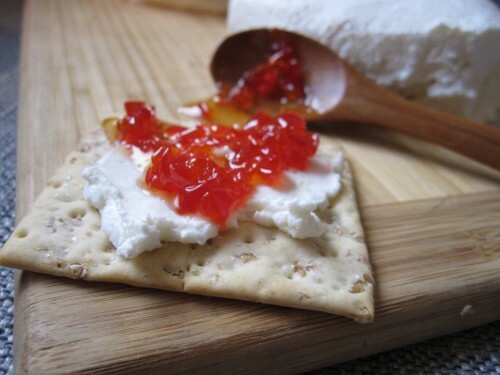 So, after testing the ricotta spread on crackers (both plain and topped with relish) the results were clear: homemade ricotta is far better in both flavor and texture. The homemade ricotta was perfectly smooth and creamy with a fresh, slightly sour flavor. The store bought ricotta had a much blander, almost plastic flavor and was slightly grainy. I’m not sure that these differences would be apparent if the ricotta was used in a highly flavored pasta dish, but when eaten plain, the difference in flavor was very obvious. The homemade ricotta was extremely easy to make, I’d even venture to say foolproof, but it does require some time commitment since it has to drain for a few hours. I have to admit, it is hard to beat store bought ricotta on time and ease of preparation. However, homemade ricotta actually turned out to be slightly cheaper, about 25 cents less a cup. Bottom Line: While homemade ricotta is easy to prepare and tastier and cheaper than store bought, it also requires a significant time commitment. It is definitely worth the effort if you are planning on serving it on crackers or in a simple dessert, but I would stick with store bought ricotta for more complicated dishes where the flavor is less important. I’ve had making my own ricotta on a list of goals for awhile. When I was much younger I used to make cream cheese all the time, with similar results. I’d seen suggestions for serving fresh ricotta drizzled with good local honey and was intrigued. Your Sweet Pepper Relish combo looks fantastic. When I return home from our vacation in Maine I’ll give it a try. That is after I let my body recuperate from lobster overload. We’ve made it three times so far. It’s only $3.75-$3.99/pound! 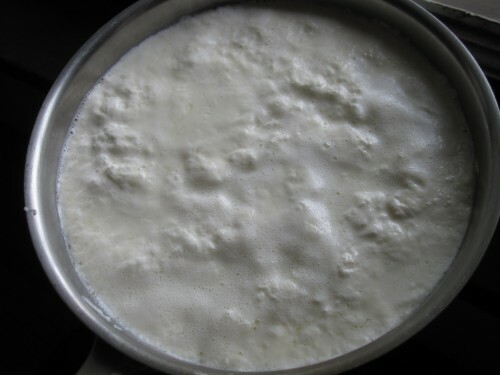 I’ve made ricotta at home and used it in lasagna.I used to use cottage cheese that I whirred in the food processer because I found store bought ricotta too dry and chalky. But with homemade ricotta the lasagna was creamy, light and delicious! I can’t wait to try both recipes!